With the hoo-ha surrounding the Apple Watch launch, you'd be forgiven for thinking that wearable tech is something new. The truth is, since the dawn of time, human beings have altered or augmented their bodies. Tattoos are a big part of cultures around the world, body piercing dates back to biblical times, and jewellery has been found dating back hundreds of thousands of years. It's only comparatively recently that we've been using what would have been decorative trinkets - bracelets, headdresses and necklaces - to actually do something. Here we look at how wearable technology has changed over the past 400 or so years. Just as the abacus was a precursor to the modern computer, the abacus ring was the forefather of today's wearables. This marvellous 17th-century Chinese implement allowed bean counters to perform mathematical tasks without using the written word, instead moving tiny beads along nine rows - and there were no issues with battery life either. Around the same time the pocket watch was taking off in Europe. Early timekeeping devices were contained in large drums which the user hung around their neck, and they merely consisted of an hour hand. By the end of the 19th century pocket watches had reduced in size considerably, but it took a German artillery officer, frustrated with having to use both hands to operate one, to come up with the idea of strapping the device to his wrist. If only he'd patented it. In 1907 German inventor Julius Neubronner invented what was arguably the first GoPro. His tiny lightweight camera couldn't shoot movies, but it featured a timer mechanism so that it could capture a single image. It wasn't worn by extreme sports fanatics, either - instead it was strapped to homing pigeons in order to take aerial photographs. Then again, being a pigeon is kind of an extreme sport unto itself. The first truly wearable computer didn't appear until 1961 - and, of course, it was created to help a pair of cunning mathematicians cheat at roulette. Edward O. Thorpe and Claude Shannon concealed a timing device in a shoe which could fairly accurately predict where the ball would land on a roulette table. The number was communicated via radio waves to the gambler with a great deal of success - Thorpe reported a 44 per cent increase of winning bets. Other mathematicians developed similar machines, proving so successful that the state of Nevada - where Las Vegas resides - passed a law prohibiting them in 1985. Mass production of the microchip in the 1980s brought with it the potential to create smaller and lighter computers than ever before. Steve Mann, a researcher and inventor specialising in electronic photography, began his EyeTap project in the early 1980s. At the time it was clunky and made the wearer look like a motorcyclist who'd been a pretty unfortunate event with a television, but the idea itself was astounding. Mann wanted to create a machine that would record what the user saw through their right eye, while allowing them to see through it at the same time. Over the past few decades Mann has gradually whittled it down to a sleek and simple headset which looks rather a lot like Google Glass. Meanwhile, VHS cassettes and consumer-grade camcorders were becoming more prevalent, and in the mid-80s these were a cheap and comparatively compact way to capture video. 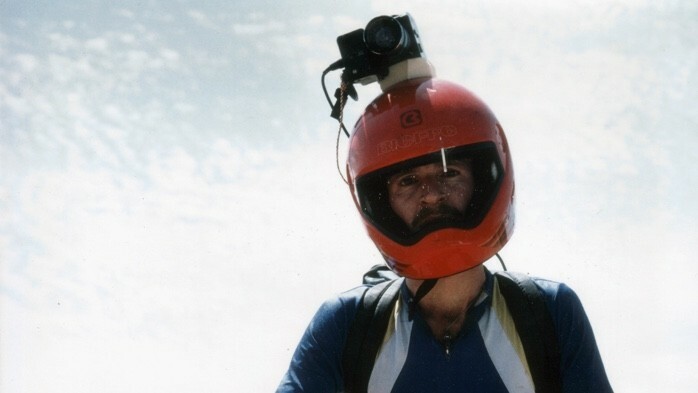 Mark Schulze, a mountain bike fanatic, created the first helmet cam by rigging a video camera to a portable video recorder. It was awkward and heavy, but with The Great Mountain Biking Video, Schulze created introduced audiences to an adrenaline-pumping first-person view of the bone-rattling sport. The explosion of portable computing in the early 90s resulted in lots of stabs at wearables with varying degrees of success. Key to this early wave of wearables was Reflection Technology's Private Eye, a head-mounted display which used a vibrating mirror to created a display directly in the wearer's field of vision. Inventor Doug Platt adapted the display to work with a DOS-based hip-mounted computer, creating at once one of the world's first wearable computers and the world's worst Batbelt, while Columbia University students used the Private Eye to build an augmented reality repair system for laser printers. Both were research projects which didn't leave their various American universities, but they set the idea of wearables in motion. In the mid-90s the term wearable was used in conjunction with portable computers for the first time, and the Defense Advanced Research Project Agency (DARPA) hosted its forward-thinking “Wearables in 2005" workshop in July 1996. DARPA's heady predictions included computerised gloves which could read RFID tags, flower brooches which react to emotions and body mounted cameras. But wearables took a back seat in the late 90s and early 00s as mobile phones became the consumer gadget of choice. Inspired by a surfing trip to Australia, Nick Woodman decided to create a small, rugged consumer camera to take decent photos of his wave-riding adventures. The first GoPro was launched in 2004, using 35mm film as opposed to digital video. Chinese companies began creating mobile phone wristwatches in the late 2000s, and Apple and Nike's collaboration on the Nike+iPod fitness tracking device gave consumers a way to use their existing technology to keep fit. Fitbit, launched in 2009, worked in a similar manner, attaching to the user's belt and measuring steps taken with an accelerometer. Smartwatches were kicked off with Pebble's Kickstarter in 2012. The campaign raised a whopping $10.2 million, making it the most successful campaign at the time. It was clear that Pebble had created a device which tapped consumers' resurgent interest in wearable technology, and this in turn paved the way for today's Android and Apple smartwatches. Would you like your reality augmented? As wrist-worn devices aren't too intrusive it's an ideal starting point for wearable technology, but the head is fast becoming a piece of premium human real-estate for technology companies. Google Glass and Oculus Rift both launched prototypes in the early 2010s, proving that public interest in augmented and virtual reality wasn't dead. Join the debate: Has wearable tech left Google Glass behind? The next steps in wearables are where it gets really exciting. Magic Leap looks set to bring us a digitally-augmented vision of the world complete with fantasy creatures, while the Apple Watch launch should kick-start genuine innovation in the smartwatch market. And there's only one place to find out what's going to be the next big thing: right here on Wareable.